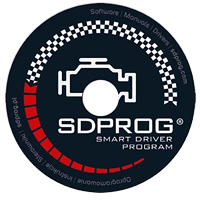 SDPROG Smart Driver Program is an innovative software that connecting to the vehicle by ELM327 interface to on-board computer provides the most important information related to his work. The tool is very easy and intuitive to use. It is a solution for those who want to have full control over your car. The program is in Polish and English language and works seamlessly with the latest systems, 7, 8, 8.1 32 and 64 bits. The application can be used for commercial and non-commercial in case you got original CD. In addition, it is possible to update the firmware. Updates are free. The program supports all brands and models of cars by 2014 irrespective of the country in which they were produced. This is possible due to the fact that the OBDII system has been installed in vehicles, along with the emergence of the Euro standards, which makes the producers of car use of uniform diagnostic system. To work is necessary diagnostic interface, which supports OBDII (ELM327 is the most common, occurring also under other names), who will communicate with the car via USB or Bluetooth. 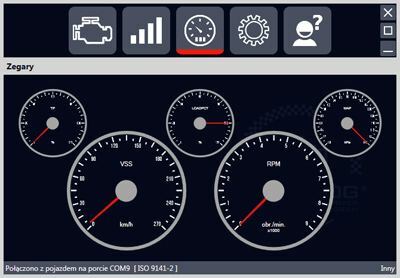 The application supports all cars compatible with OBDII (not to be confused with OBD2 connector). Approximate date of introduction of the OBDII system in the world: the United States and Asia: in 1996, Europe and the rest: since 2000 cars with gasoline engines, since 2004, diesel cars. Codes stored: these are the codes that have been confirmed. Indicate that the fault actually occurs and causes the MIL / Check Engine. Pending Codes: These are codes that occur sporadically and have not been re-registered, do not light up the MIL / Check Engine. Permanent codes: these are the codes that have been deleted, but motor controller confirmed that the fault is no longer present. Generic errors: these are errors that are defined for each manufacturer as well. Errors specific to the manufacturer: are errors, the definition of which is closely related to the car manufacturer, for each make an error number will have a different definition. Easy monitoring of selected parameters allows the option of watches, with the possibility of customization. * List of supported parameters and the data is closely linked with connectable car. 2 Connect the interface to the computer and the car. Wait a few seconds for the system to install the new device. 3 Turn the ignition in your car. 4 Run the application SDPROG. The application will automatically search for your device and the car. 2 Connect the interface to the car. 3 Start the computer wizard to add a new bluetooth device and connect to the interface (popular name OBDII, CBT, Vgate, Icar) using pin 1234 or 0000. 4 Turn the ignition in your car. 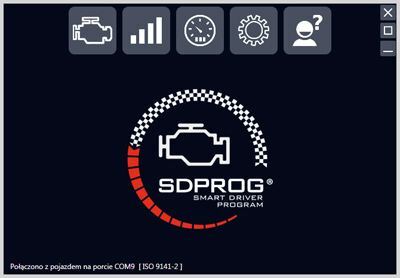 5 Run the application SDPROG. The application will automatically search for your device and the car. Products offerd on our pages are only interfaces - we don't offer any software for above units. If you need sofware for devices you must purchase them seperatly from prodcuers. 1. Offered by us accessories and replacement parts are not original car producer parts, but they have been carefully choosen from list of producers to offer highest quality.